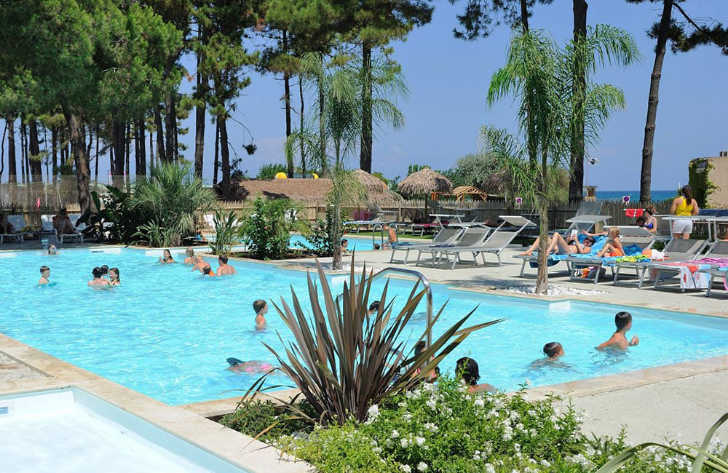 Camping Marina d’Aleria is a 4 star campsite located in Aleria in the Corsica region of France. 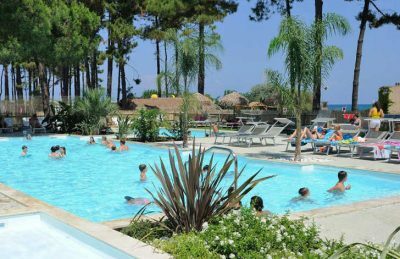 Camping Marina d’Aleria is a fantastic 4 star family friendly campsite that’s set within 9 hectares of grounds along the eastern coast of the island of Corsica. This beautiful campsite lies halfway between the old harbour town of Porto Vecchio on the southern tip of Corsica and the Corsican capital Bastia in the north. Lying within a protected natural area, Camping Marina d’Aleria campsite is surrounded by pine trees, eucalyptus trees, mimosas and other pretty flowers making it a wonderful place for a relaxing holiday. Having a central location on Corsica is brilliant for those wishing to take a few day trips to explore the beauty of the island. Trips to the north and south of the island are fairly easy and the coastline, mountains and beautiful villages offers visitors plenty to see and do during their holiday. There are a whole host of fantastic activities available on-site but you’ll also find a variety of other activities available within a short distance of the campsite including horse riding, scuba diving, jet skiing and a range of other water sports. One of the best things about Camping Marina d’Aleria is its stunning surroundings. Not only do you get the calm relaxing foliage and terrain but the campsite also lies alongside a beautiful golden sandy beach which borders the stunning crystal clear waters of the Mediterranean sea. The beach is covered in soft golden sand and is the perfect place for children and families to relax and play in the sun. Although the beach is a major bonus you’d be forgiven for thinking that the swimming pool at the campsite may not be that good but believe us, you would be wrong. There’s a great little family swimming pool along with a fairly new toddlers splash area and relaxing sun terrace which makes a fantastic alternative to the beach. Camping Marina d’Aleria campsite offers a comprehensive selection of activities and facilities on site and also nearby to ensure you have a fantastic family holiday. On-site activities at Camping Marina d’Aleria campsite include wellness area, table tennis, beach volleyball, fitness area, tennis, canoeing, pedaloes, stand up paddle boards and a playground. Facilities available at Camping Marina d’Aleria campsites include WIFI, restaurant, takeaway, bar, groceries, games room, animation team, washers and dryers. Accommodation at Camping Marina d’Aleria campsite includes a range of 2 and 3 bedroom mobile homes that are available from Suncamp.